Got a cold early in the week. Actually started the previous Thursday, but I attempted to run through it. Not the smartest thing in the world, but I thought I had a shot. Sniffles, sore throat, congestion last until about Wednesday. Took until Friday to really start feeling strong again. Back up and running now, but that’s for next week’s post. Other metrics are still good. Weight actually went down while I was sick. Guess that’s not TOO surprising. Heart rate crept up about 6 bpm. It will be interesting to see how quickly I can bring it back down. Rolling around 43 bpm in the morning before I got sick. Discovered the connection between MyFitnessPal and Garmin Connect this weekend as well. Going to have a lot of fun playing around with those sites. MyFitnessPal tracks calorie consumption and Garmin Connect tracks exercise, and the sites share information. I’m sure an integrated site would be better, but for now, I’m just getting a kick out watching the two sites sync. Nerd. I know. Only hurts a little. Got a good feeling about this upcoming week and rest of the summer. Sure, I’m not going to accomplish a lot of my goals that I set out. But, I’m still in some semblance of shape, and I’ve got better control of my diet than I’ve ever had before. Just need to put it all together for a few more weeks. Going to see some results in 2014. I feel it. Hit 48 miles in a week in late July-August. [44 this week is planned. Going to be some tough miles coming back. 13 runs planned.]. Three more weeks. Time to close this thing … out. Workout: 1.22 miles @ 5:50 pace. Weather: 72 degrees, rain. Recap: Really didn’t get a lot of help from the weather today. Rain and lightning and such. That said, I’ll just have to try again tomorrow. Worked with a lot quicker stride today, and that was nice. Have to get away from staring at the Garmin sometimes. Early in the run it always tells me I’m going way slower than I need to be. For some reason it doesn’t pick up the pace until about 30 seconds in to the run. After that, it’s pretty good though. Need to up the protein intake I think. I used a stick roller on my quads and they’re still sore. 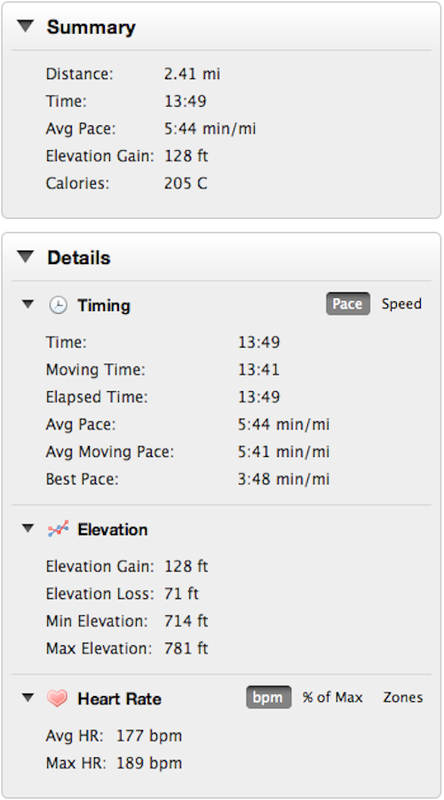 Hoping to get back in the swing of things soon – that is, back to 3 milers. Reading a book on Abraham Lincoln and depression (Lincoln’s Melancholy). Really amazed that the greatest President ever struggled so much mentally. Feeling inspired by his story though. Going to read about Grant next. Love these Civil War guys. Straight toughness and perseverance. Workout: 2.41 miles @ 5:44 pace. Weather: 77 degrees, cloudy. Recap: Didn’t quite have enough today. But I did learn a lesson about relying on the GARMIN. Needed 5:37 pace for this run. First mile was right on 5:37. I started feeling fatigue in mile two. Then the treachery began. 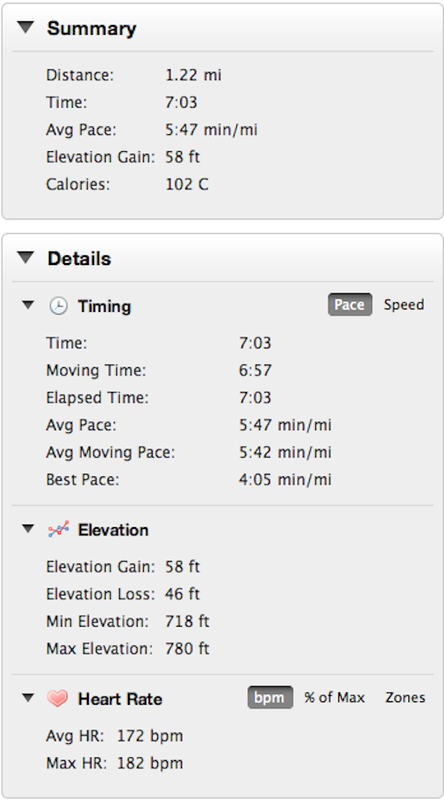 The GARMIN told me I was moving at 6:07 towards the end of mile two, and then didn’t give me me a split for that mile. I assumed I ran the second mile at 6:07. I tried to speed up a little at the beginning of mile 3, but figuring that I was already 30 seconds behind, I stopped running. After getting home and uploading the splits to the website, I saw that the second mile was in 5:44. A lot better effort than I thought. Excuses aside, I was genuinely tired at the end of mile 2, and I don’t think I would have made it much further before crashing. 1) Repeat this week of training with 2-mile runs. 2) Make sure the nutrition is on-point (I did OK last week, but I can do better). 3) Try again next Saturday. *If it doesn’t work out next Saturday, I’ll start taking every other day off. Workout: 2 miles @ 6:50 pace; core work. Weather: 70 degrees, partly cloudy. Recap: Felt easy enough today. Probably could have gone on for 6 or more miles. Had a chance to try something new during the run. Yesterday, someone in the blogosphere posted a great video about “running tall”. That is, not bending or slumping over as you run. So I tried it. The first thing I noticed is that when you run tall, the hips seem to have more mobility – there’s a nice circular type motion with the legs. On the other hand, running upright is a little taxing on the torso and abs as well. I had to try to remind myself to breathe and not be too stiff. 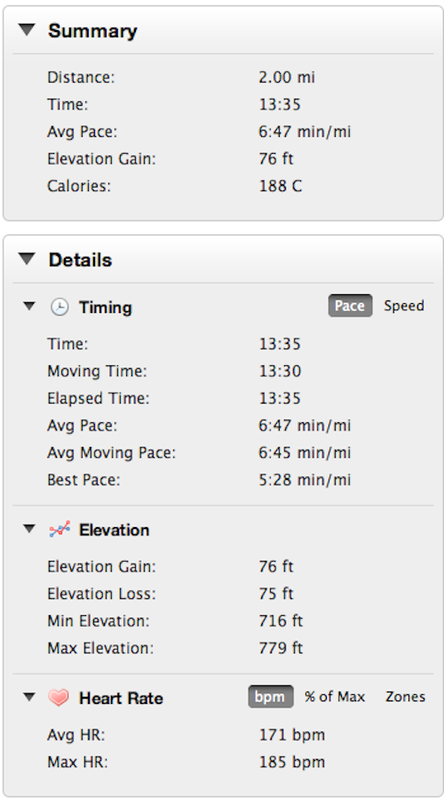 The Garmin says I began today’s run between 5:50 and 6:20 pace before I realized what was going on and slowed down. That’s a great confidence booster going into this weekend’s time trial where I’ll look to hold 6:17 pace for 5K. Afterwards, I’m excited about the opportunity to put running tall into practice every day. Have a great day and thanks for reading!